Meeting was called to order at 19:33 with 22 present. We have a quorum. Julio and Lloyd were both not present tonight and Miguel presided over the meeting and welcomed everyone. The meeting was not broadcast live on the air tonight from the EOC. There was testing being conducted in another room tonight. Everyone took turns and stated their name, call sign, and a ham project they did the last month. Miguel welcomed everyone again. He announced that George Phillips donated more items to the club. The minutes were posted on the website. A motion to accept the minutes as posted was made by Lee, seconded by Dave. Ryan is not here tonight for the Website. Miguel announced that the website is up and running. 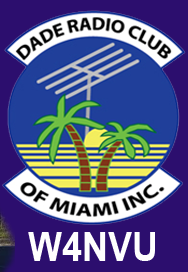 Club Elmer/PIO – Miguel stated that there will be a hamfest in Ft. Pierce on August 15; another hamfest in Melbourne on October 10-11. He has received calls all month. The nets are every Wednesday night. He showed us the list posted on the website of various south Florida nets and read the list. Miguel suggested that we get our radios checked out before an emergency. Brandon needs more net controllers to get involved so they can be rotated in and out. At our next meeting Lee Abrams will check out your radio if you bring it. He also announced that Steve Taylor of the Everglades Radio Club conducts digital radio on Sunday evenings. You can sign up at soflahams.com. Hamboree – Lloyd is not present tonight. He is the chairman for 2016. He is still looking for a venue. If you have any suggestions, contact Lloyd. Newsletter – Lloyd stated that we need people and articles. If interested, please see Julio or Lloyd. The 147.000 – Miguel announced that it is not working. The tower was sole and we need to get permission to go up and bring it down. The 147.760 – Ray advised it is working great. The audio is a little low but its working. 220 – @ Childrens Courthouse – nothing new. The 444.200 – Carl stated that it’s up and running. Fusion Radio at Coral Gables. Miguel explained how it works. Carl will find the PL tone and will post it on the website. Emergency Committee – Miguel advised if you are available for incidents, to fill out an application and give it to him. Miguel showed a few videos on 2 meter FM. “Getting Started on Ham Radio 2meter FM – parts 1, 2 and 3.” Great presentation! Miguel announced that Angel Noble passed his test and is a new Tech. Jeff Dorsey passed his Extra. Congratulations!!!! George Phillips donated an antenna and an antenna matcher. Joanne won the antenna and Jeff Dorsey won the antenna matcher. Miguel reminded everyone that Lee Abrams will check out your radios at the next meeting. George Phillips made a motion to adjourn, seconded by Hollis. The DRC meeting was adjourned at 20:35.